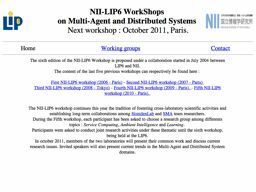 The NII-LIP6 workshop continues this year the tradition of fostering cross-laboratory scientific activities and establishing long-term collaborations among HonidenLab and SMA team researchers. During this two day workshop, members of the two laboratories will present their work and discuss current research issues. Invited speakers will also present current trends in the Multi-Agent and Distributed System domains.